Nestled at timberline below the majestic peaks of the Colorado Continental Divide, 10th Mountain Division Hut forms a perfect destination for a single hut trip or ski-through using other nearby huts. 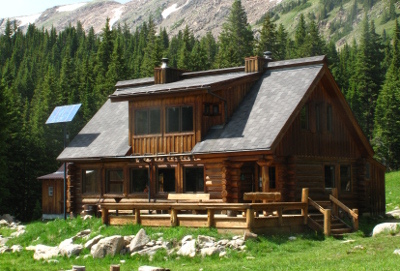 Completed during the summer of 1989, the hut was built in honor of the 10th Mountain Division of the U.S. Army, using funds donated by 10th Mountain Division Veterans Bill Boddington, Col. Pete Peterson, Maury Kuper, and Bill Bowerman. Layout and capacity: Upstairs: 2 private bedrooms, 1 with 6 beds, 1 with 4 beds, and a communal sleeping area with 1 double bed and 4 single beds. Capacity 16. 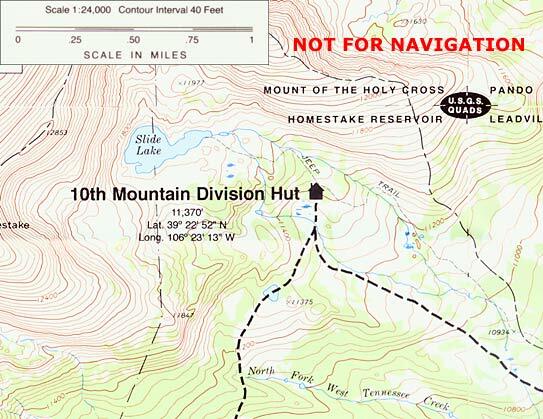 The most common route into the 10th Mountain Division Hut is from Crane Park but route finding can be a bit tricky due to numerous other trails and roads in the area. The ski in from Tennessee Pass is more scenic but longer and still poses some route finding challenges. Whichever route you choose be sure to watch for the blue diamonds marking the trails. In the summertime you can get to the 10th Mountain Division Hut by hiking or biking up the Slide Lake Road to the hut, there is no established summer hiking trail to the hut. This road is open to vehicle traffic but is an extreme 4WD road that is periodically closed due to washouts and road damage. It should only be attempted by experienced drivers with the proper vehicle. Motorized vehicles must park at the summer closure gate approximately 1/4 mile from the hut. Vehicle access is never guaranteed to any hut at any time. From the 10th Mountain Division Hut you can access the Colorado Trail by hiking back out the Slide Lake Road to where it intersects the trail. From there you can hike southwest towards Uncle Bud's Hut or northeast towards Tennessee Pass. A hike up to Slide Lake or the top of Homestake Peak also make for beautiful day trips. Below is a tribute film for the 10th Mountain Division Hut. The film was produced and directed by George and Beth Gage of Gage & Gage Productions, who also made Fire on The Mountain: The Story of the 10th Mountain Division. The film follows the 10th Mountain Division during WWII and the soilders who inspired the hut system.